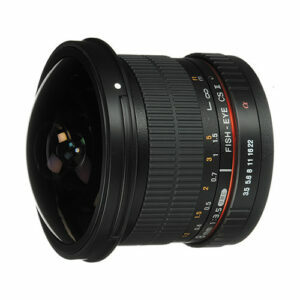 Lens Description: The 8mm f/3.5 Fisheye Lens with Removable Hood for Nikon from Rokinon gives you a 180º view with dramatic, exaggerated perspective when used with an APS-C camera, or a powerful circular image floating in the frame when used with a full frame digital camera or 35mm film camera. With hybrid aspherical elements and multi-layer coating, you will produce sharply defined images with a minimum of flare and ghosting. The 8mm lens focuses as close as 12" (30.48 cm) from the lens. This version of the 8mm f/3.8 Fisheye lens comes with a removable lens hood that will offer glare reduction and lens protection, but can be removed to offer an increased and unobstructed angle of view when shooting with full frame digital or 35mm cameras. Es un lente maravilloso! A menos de una semana de uso no dejo de divertirme, lo recomiendo. No tiene autofoco, pero hasta el momento todas las fotografías que realicé fueron con el foco en infinito y a f/8, sumando un flash dedicado, y utilizándolo sólo en interiores. Ya tendré tiempo para realizar fotos a paisajes y en exploración urbana y no creo que me decepcione!